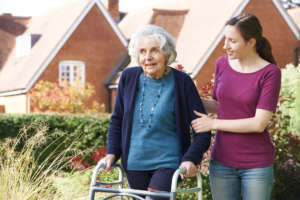 In-Home Supportive Services (IHSS) is a combined federal, state, and locally-funded program designed to keep the elderly, the visually-impaired, and the disabled in their own homes. The program offers assistance to qualifying individuals for services that assist with daily living activities, including feeding, bathing, dressing, housekeeping, laundry, shopping, in home-therapies and medical procedures, protective supervision, assistance with medical appointments, and paramedic services. Generally, after an individual applies for assistance, an agency social worker will meet with the applicant and assess functional needs and qualifying services. Then time is allotted (in hours) for each service and the social worker determines the projected/allowable expense. Once that decision is made, IHSS determines how much it will contribute toward those expenses, based on the applicant’s monthly income. Sometimes, applicants are required to share in the cost of services rendered. Once IHSS approves an allowance for qualifying services, the recipient is responsible for contracting with others to provide the necessary assistance. Those contractors must be approved by IHSS. The agency will determine the maximum allowable hours for each activity and require that the recipient and/or the contractors file a monthly timesheet for services rendered. In most cases, it is the responsibility of the program participant to supervise and approve hours expended. The contractors will then be paid through IHSS. The program participant receives no funds and is required to pay only their pre-determined share of the cost of services. To qualify for IHSS, an applicant must 65 or older, blind, or disabled, and be a California resident, live in their own home, and be eligible for Medi-Cal, even if they are not currently enrolled. Income. Income must not exceed a pre-determined percentage of the Federal Poverty Level. Immigration status. Generally, Medi-Cal recipients must be in this country legally. Disability. Anyone who receives Supplemental Security Income (SSI) or Social Security Disability Income (SSDI) may qualify for Medi-Cal coverage. In addition, those who are considered disabled by the Social Security Administration may qualify. Property. Medi-Cal sets limits on the value of property that can be owned by recipients. Applicants are also required to submit a Health Care Certification form signed by a licensed healthcare professional. IHSS is an important resource for those who need assistance with daily life activities, but overall, are independent enough to remain in their own homes. The provision of caregiver and other services ensures that not only can the recipient function fully on their own, but also remain safe. However, there may be times when an individual has needs so great that they are better off in an assisted living or nursing facility. Whether to pursue assistance through the IHSS is a decision that must be made in consultation with a primary healthcare care provider.